Many know the tale of the remarkable engineering feat Chicagoans took in the 1890s to reverse the flow of the Chicago River. Yet even before that was completed in 1900, we dug a large straight channel downtown for shipping that removed many of the best fish hang-out spots. Throughout the lifecycle of fish, they seek out shallow, rocky areas for spawning, mating, and maturing. Given the depth of the Main Stem downtown however, the Chicago River has been less than a four star resort for its aquatic life. Friends was able to offer an alternative vision for fish habitat and recovery by installing the Fish Hotel in 2005. Thousands of visitors from around the world were in awe of the beautiful floating garden, our Fish Hotel, off of the Chicago Riverwalk. This glimpse of color along Chicago’s second waterfront not only provided an oasis in the midst of a busy city and gave valuable habitat in an otherwise limited reach of the river, but it inspired the City of Chicago to commit to more permanent habitat that will take the river to the next level. Fish are making a remarkable comeback. We achieved our goal to demonstrate that fish habitat can be established in the Main Stem. In 2012, we removed the Fish Hotel from the Chicago River because we had achieved our goal—proving that if we built habitat fish could thrive. 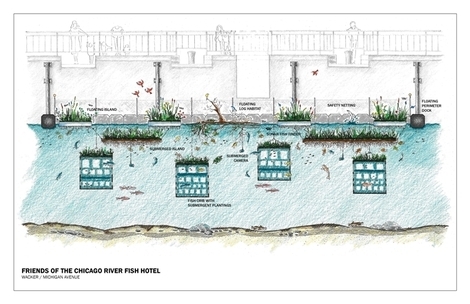 In 2015, the City of Chicago opended Phase 2 of the Chicago Riverwalk which includes the Fish Hotal concepts at The Jetty and now there is permanent fish habitat established right downtown. This new version of the Fish Hotel and beautification project will continue the river’s renaissance as an asset to Chicago and its people.